All suppliers who would like to work alongside Sanok Rubber Company S.A. are required to fill in the supplier questionnaire, to self-assess the supplier’s quality management system and to sign a confidentiality agreement (forms of all documents with the possibility to print and download are below). The development and manufacturing of innovative and competitive products for our customers all around the world demands a high level of involvement and openness to new ideas. To meet those requirements we need effective and reliable suppliers. It is not uncommon for purchased materials and services to reach 50% of the total cost of products manufactured by Sanok Rubber Company S.A. As you can see, our company’s success greatly depends on the competence of our suppliers. We are therefore looking for effective suppliers who can bring a meaningful contribution into the development of our company. We offer our partners good growth perspectives and long term solid business relationships. Below are the fundamental requirements for suppliers for Sanok Rubber Company S.A.
Quality Specification and Environmental Requirements for Suppliers for Sanok Rubber Company S.A.
Labelling the deliveries to Sanok Rubber Company S.A.
Sanok Rubber Company S.A. is the European leader in the field of rubber products, rubber-to-metal articles, combination of rubber with other materials. Rubber compounds producer with a wide range of products portfolio for the automotive, construction, agriculture, pharmacy and household appliances. For over 85 years we have provided our clients with the highest-quality products, which comply with all the latest technological standards. We care about the environment and support local communities. We merge tradition with modern thinking every day. 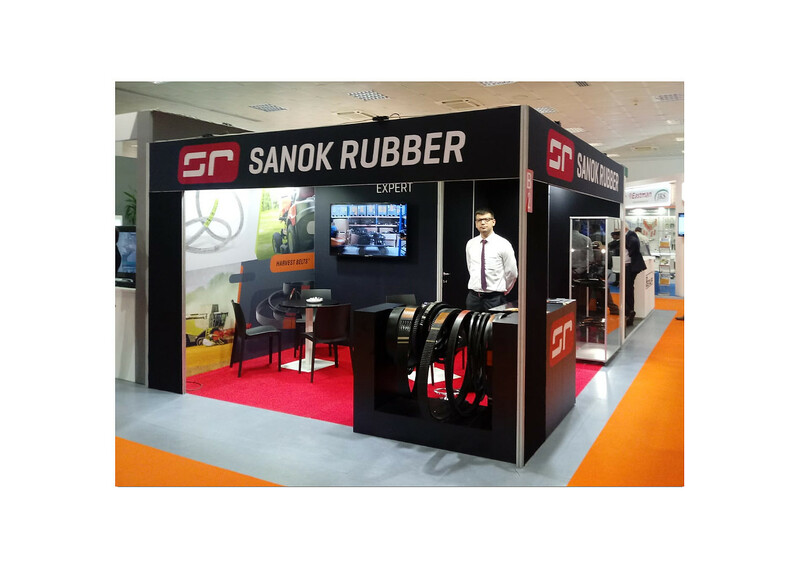 From 7th till 11th November 2018 Sanok Rubber Company actively participated in the international trade fair "EIMA 2018" in Bologne, Italy. During 5 days of the trade fair, We presented a wide range of V-belts produced and developed by Our Company. We would like to thank all visitors. On October 18th, 2018 in Warsaw, the Annual Construction & Millwork Solutions Gala took place organized by the Industry Forum. The meeting was accompanied by the granting awards. Sanok Rubber Company S.A. received an award confirming its Leader position of Construction & Millwork Solutions Market in 2018, as a supplier of seals for windows and doors. Reacting to our clients’ needs and implementing cutting-edge solutions is a daily norm for us. Modern economies never stand still. There are constant changes which involve technologies, management methods, the needs of the clients and the capabilities of the providers. New products appear virtually overnight. In such an environment, you need a tried-and-tested partner who keeps up with all trends and can guide you in the optimal direction. At Sanok Rubber Company S.A., we believe that such factors as high quality goods, state-of-the-art technological solutions and respect for the environment are inseparable. For our clients, we select cutting-edge raw materials and the most effective manufacturing processes. At our company “the highest quality at the lowest prices” is a fact rather than a mere slogan.